Lusail Light Rail Transit will open to service in 2018. Image courtesy of Lusail Real Estate Development Company W.L.L. The network will consist of 37 stations, including ten underground stations. Alstom will supply 35 Citadis trams to the four lines of the network. The Lusail Light Rail Transit (LRT) system in the new city of Lusail, 15km north of Doha, Qatar, is being developed by Qatar Rail. The network will consist of four main tram lines that span 33.1km and 37 passenger train stations, including 26 at ground level, ten underground and one elevated interchange station. The Lusail LRT, along with Doha Metro and the Long Distance Passenger and Freight Rail transportation system, forms part of Qatar’s $30bn integrated transportation system. It will be linked to the Doha Metro Red Line north via two stations, namely the Lusail main station and Lusail Marina / the Pearl station. The first line of the light rail network, Yellow Line, is scheduled to open in 2018 and the remaining three lines are expected to enter commercial service in 2020. The light rail network will comprise 10.4km of underground track and 22.7km of ground level and elevated tracks, including a 0.5km track between two high-rise buildings. It will include approximately 8km of single track and 25km of double track. 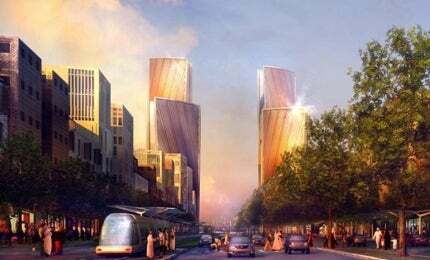 "These stations will connect Fox Hills district, the Northern Residential district, the Medical and Educational districts, the Golf district and Lusail City’s plaza." The elevated interchange station will serve the tram running on a viaduct across Al Khor Highway. The northern sector of Lusail City will contain ground-level stations featuring centre, side and split-side platforms. These stations will connect Fox Hills district, the Northern Residential district, the Medical and Educational districts, the Golf district and Lusail City’s plaza. In the southern part of the city, 8km of underground tracks will link various residential districts and serve underground stations in the Marina district, Energy City, Qatar Entertainment City, Qatar Petroleum District and the Pearl. A service depot with maintenance and storage facilities, as well as a test track will also be built as part of the project. The LRT was conceived to enhance transportation within the planned city and improve connectivity to entertainment centres such as Lusail Stadium that will host 2022 FIFA World Cup matches. Construction of the network is being carried out in phases, starting with the design phase in August 2007. Earthworks and excavations for the cut-and-cover tunnels began in March 2009 and the tunnel construction started in March 2010. The ground works for the underground stations commenced in June 2011. The first light rail project in Denmark, Aarhus Light Rail Project will introduce a tram-train system in Aarhus. As of June 2014, all of the excavation works and more than 7km of the tunnels were completed, in addition to the access viaduct across Al Khor highway. The main civil works of seven underground stations and four above-ground stations were also completed by that time. The Lusail LRT will be operated with a fleet of 35 Alstom Citadis trams. The 32m-long, 100% low-floor trams ensure easy access to passengers. The trams will run on catenary-free electrification system except inside the tunnels where a dual-power connection with a catenary system will be installed. The Alimentation Par le Sol (APS) technology installed in the trams will allow ground-level power supply from a third rail, avoiding the need for overhead cables. Lusail will be the second tramway system among the Gulf nations to be equipped with Alstom’s APS technology after the Al Safouh Tram Project in Dubai. The QDVC joint venture, comprising Lusail city’s developer Qatari Diar and French contractor Vinci Construction Grands Projects, is the main design and build contractor for the project. The Systra-led design team includes Atkin and Hyder Consulting. Systra is overseeing all the design activities of the project, including station architecture, power supply, alignment, depot lay-out, equipment and rolling stock. The preliminary designs and drafting of the bill of quantity (BOQ) for the depot and stations are undertaken by Atkins. In a joint venture with AECOM, Parsons manages the construction of the light rail transit system under a five-year contract with Qatar Rail. RMD Kwikform is providing an integrated formwork and shoring for the underground tunnels. Alstom was contracted to design, manufacture, commission and service 35 Citadis trams and power supply equipment, including substations, catenary and APS technology. Alstom will also be responsible for the signalling and trackworks. The contract also includes options for an additional 32 Citadis trams.